Rabbit and Crow watched as the sun came round over the field. “Did you sleep well?” Rabbit asked Crow. “I dreamed that I was running through the meadow,” said Crow. 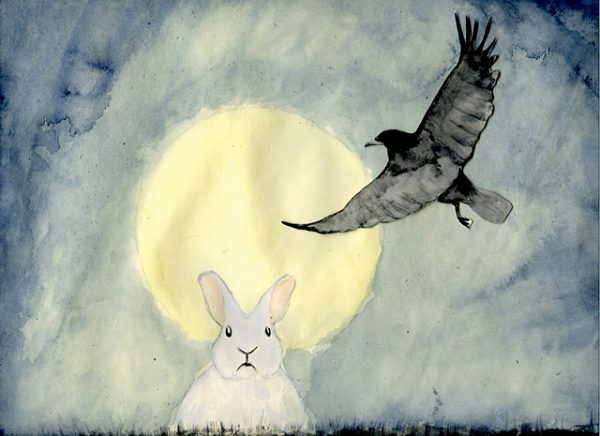 Rabbit and Crow set a spell in silence. “A real wet one,” said Rabbit. “Lightning struck the locust tree,” said Crow. “The young one?” asked Rabbit. They looked at the wind bend the gold blossoming seedheads atop the field of tall fronds. “I’ll have a look,” said Crow. He felt the wind with his wingtips and bounced up from the ground, flapping close above the long grasses as he looked down. Rabbit sat still as a stone and stared straight at the stalks, listening. Crow circled higher. His sharp eyes kept steady on the lookout. Just then, tiny Wood Tick made her way through the thick fur on Rabbit’s shoulder. When she reached the bottom of Rabbit’s ear, Wood Tick crept down to the pink skin at the base of a hair, opened her jaws wide, and bit. Love the peace and quiet of this simple story of friendship. Made me smile. Thanks, Norman. Yes I so needed that.